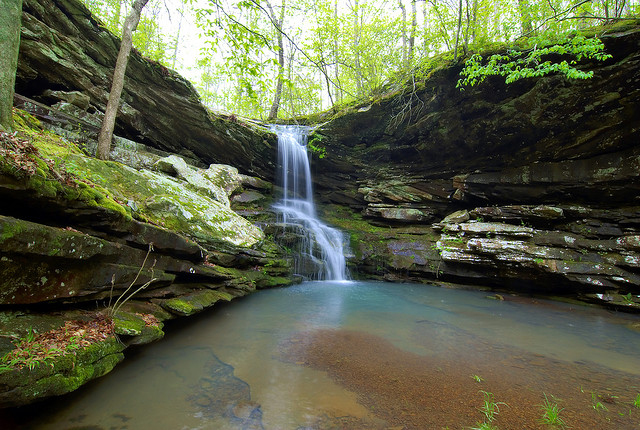 Magnolia falls in Arkansas; photo by Danny Barron on Flickr (noncommercial use permitted with attribution / no derivative works). It's the spirit of the Capitol dome. It's the spirit that's in each and every home. It's the spirit of tomorrow and today. It's the spirit of friendship, it's the spirit of hope. It's the spirit of the forest, it's the spirit of the eagle. It's the spirit of the country that we love. It's the spirit that shines from above. It's the spirit of the music that we play. Oh Arkansas, Oh Arkansas, Oh Arkansas U.S.A.